As means of communication becomes easier and social media gives just about anyone a platform it’s easy to take shots at other camps based off of sound bites and clips. In all honesty, this is painful for me and I see this occurring all over Facebook and Twitter. On the one hand, its important to have the ability to voice concern but it becomes scary when it turns into a monster fight via social media. When people find their identity in a theological position, denomination, or conviction and not in Jesus there’s a serious problem. And when Christians make the minors majors it’s a serious problem. The moment of truth. If you ask me what camp I’m in the easiest answer is to say I’m reformed. But my identity is in Christ. My hope, faith, source of life, is in Jesus. Don’t get me wrong, as a stereotypical “reformed” type I’m absolutely into theology and my favorite books revolve around theology and doctrine. And at times I read blogs and articles that pin point the “reformed tradition” as being ego and intellectually driven, just a fad, or more committed to tradition than Jesus. Regardless of if this is true or not, what matters is my response. I have two choices. Here are three reasons why I believe the gracious response is always the best option. 1. The scriptures tell us too – Psalm 133:1, “Behold, how good and pleasant it is when brothers dwell in unity”. David helps us to illustrate the importance of unity by giving us two examples. Precious oil anointing Aaron – In this imagery we find Aaron who served as high priest being anointed with precious oil. The oil would eventually flow down on his beard and over his chest which would have the names of the twelve tribes of Israel. Essentially, a consecrated, unified, and holy people of God would serve as an example to the rest of the world. Falling dew – Dew served as symbol of refreshing, quickening, and invigoration. 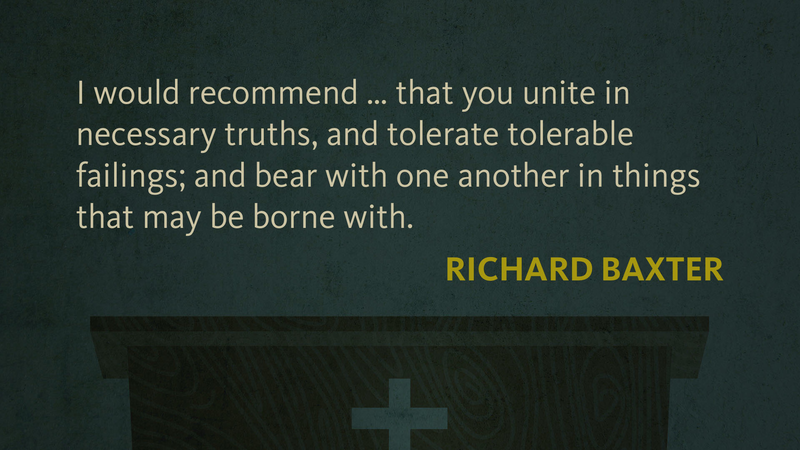 Likewise, brotherly unity should cause a resurgence, renewal, and refreshing for the believer. When responding in these situations we should consider how it will affect the unity of the church universal. If our response destroys unity, it’s not helpful or edifying for the church. 2. It fosters reconciliation not destruction – A gracious response may be the difference in a long and positive relationship. An un gracious response may be the catalyst for a destroyed and lost relationship. A family has fights and arguments. There are often different perspectives and opinions. However, each conversation should be aimed toward reconciliation, the same can and should be said between Christians. 3. It provides a bridge for honest conversations – If we are able to do the first two, the benefit could be an honest dialogue where both parties are heard. Its not about who wins, rather about understanding each others perspective. Our value and ability to live in unity in spite of different perspective on the minors is a thing that honors and edifies the church. Please don’t misunderstand me. If something is said that falls blatantly outside the framework of the orthodox Christianity, we must address it. In fact, as pastors it is our responsibility to address such matters as we lovingly lead our people. This is not about being passive and not holding to convictions. It’s about holding to convictions while still representing Christ well. James E. Smith, The Wisdom Literature and Psalms, Old Testament Survey Series (Joplin, MO: College Press Pub. Co., 1996), Ps 133:3. This entry was posted in Leadership, Theology, Uncategorized and tagged Bible, Grace, Theology, Unity by jmuddamalle. Bookmark the permalink.